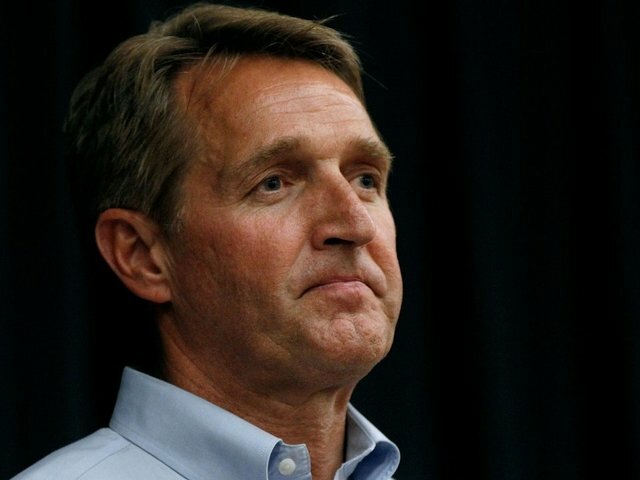 Senator Jeff Flake, an Arizona Republican, announced Tuesday he would not run for re-election in 2018, condemning in a speech aimed at President Donald Trump the "flagrant disregard of truth and decency" Flake says is "undermining American democracy." "There are times we must risk our careers," Flake said in a speech on the Senate floor. "Now is such a time." Flake, who has criticized the path that the Republican Party has taken under Trump, said the impulse "to threaten and scapegoat" could turn America and the GOP into a "fearful, backward-looking people" and a "fearful, backward-looking party." Flake didn't mention Trump by name, but clearly was directing his remarks at the president and his administration. Watch the raw video of Flake's speech on the floor of the Senate in the video player above. Flake is a conservative who favors limited government and free markets. "A political career does not mean much if we are complicit in undermining these values," he said. His extraordinary speech came shortly after Trump had joined Senate Republicans at their weekly policy luncheon, and came a few hours after the president had engaged in a war of words with another retiring Republican senator, Bob Corker of Tennessee. "Flake was the number one critic from the Republican Party saying he [President Donald Trump] would be the end of us, and he won," OH Predictive Insights pollster Mike Noble said. "You have roughly 80% of Republicans support the president, so what does that say about Jeff Flake?" "He's going to hold to those ideas and principles that he thinks should be governing the GOP, and that takes a lot of courage," said Bettina Nava, a political consultant who used to work for Sen. John McCain. But mainstream Republicans in Arizona believe Ward cannot beat Rep. Krysten Sinema, who is running in her primary as the only well-known Democratic candidate. They've been searching for another candidate to take on Flake, and his decision to step aside opens the door wide for those efforts. Sinema released the following statement Tuesday afternoon, "It's been an honor to know and serve with Jeff. He is a man of integrity and a statesman who is true to his convictions - an Arizonan through and through. I wish he and Cheryl and their family the very best." Besides Ward, other potential candidates for Flake's seat include current state university regent Jay Heiler, former state GOP chairman Robert Graham and state Treasurer and 2016 Trump campaign CFO Jeff DeWit. Other names that have been floated in recent weeks include Reps. Paul Gosar and Trent Franks, conservative stalwarts who sit in safe GOP seats. "I've known Jeff for a long time and I admire him for his service that he has given to our state," she said Friday. "But I believe it is an opportunity for me to support a different candidate, someone that I've known for a long while, and somebody that I believe will serve Arizona the best." With @JeffFlake announcement that he won’t run for re-election, the 2018 Senate race about to get real interesting! 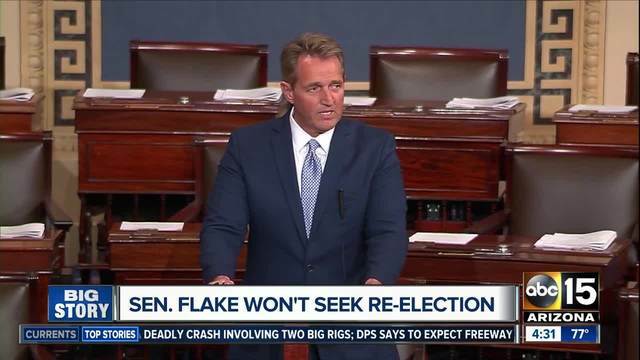 Flake has not said what he will do after leaving the Senate. "I'd be looking out for him at some kind of think tank that helps push public policy," said Nava, the political consultant. "I think that that would probably be a good fit for someone with his ideas on commerce, free trade, immigration."